I lay it all out on large platters give them plate and let them dig in. It is a fun and easy way to get them eating different things and is a special treat that helps with independence. Terry Treetop loves climbing trees, so his dad built him a tree house in a tree. Terry loved his tree house but he began to get lonely. Terry goes for a walk to find some friends and ends up saving the day. Everybody called him Terry Treetop because he loved climbing trees. Terry was alone, so he went on a journey to find new friends to invite to his new tree house. He almost gave-up when a new opportunity came his way. Will Terry use this opportunity to find new friends ? This beginner readers eBook Series will motivate and inspire your kids to be active about the things they want to achieve in life, and not to give-up on their quest for love and happiness. 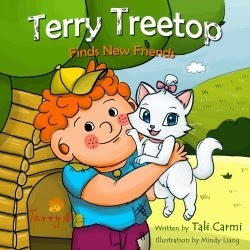 Your kids will enjoy full colorful illustrations of Terry and the animals he met. How to be self motivated. How to persist and not give up. How to give and get love.